My Alfa is a mostly completely original car, meaning that it’s never been “restored”, not in the sense that classic cars are restored with all-new cosmetics and completely overhauled mechanicals. Yet with 65,000 miles on it (and counting), there have been maintenance and wear items needing attention. The car is wearing about 90% of the paint and 100% of the interior with which it left the factory. The engine, gearbox, and rear axle are likewise the same assemblies that Tony, Vito and their fellow factory workers installed. During the past 51 years, the car has gotten new tires, brakes, belts, hoses, bulbs, shocks, clutch, tune-up parts, and fluids. I’m very conscious of my role as “steward” of this car, and hope that when it eventually moves to its next owner, the preservation efforts will continue. As you may know from reading this blog, I’m not shy about putting several thousand miles a year on it, and if the paint gets a little worn or slightly chipped from my enjoyable time behind the wheel, so be it. But I would never consider repainting the car. Likewise, should a major engine component fail, I’ll repair it as necessary, but I’m not going to seek out a larger engine from another Alfa. I’m continually striving to maintain that balance whereby I get to enjoy the car while only fixing what needs fixing. Earlier this year, I discovered that the reverse light didn’t work. The truth is, in the 5 years I’ve owned the car, I don’t think I had ever checked the back-up light. Its inoperative status gave me the impetus to remove the light assembly (there’s only one, below the rear bumper) and get it working again. The overall goal was not to replace it, but refurbish it, reusing as many of the original components as possible. 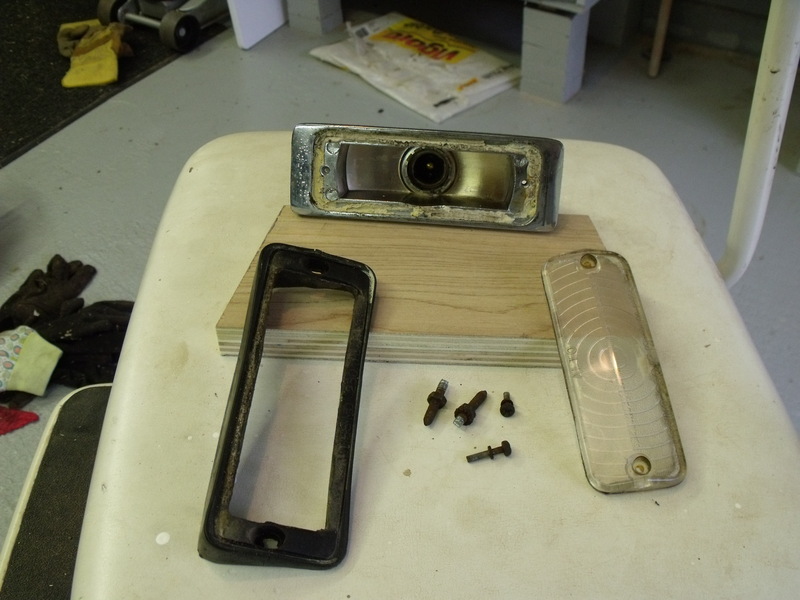 The first challenge presented itself when two of the four fasteners snapped during removal. 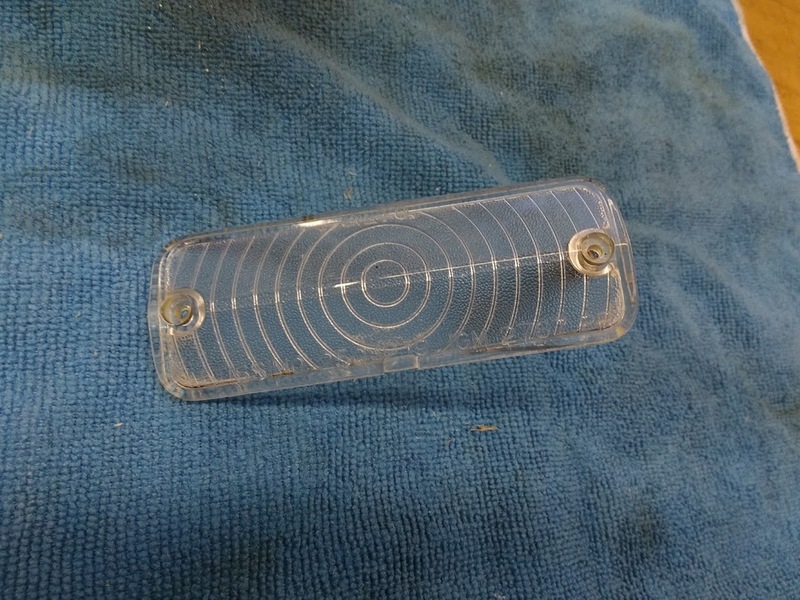 The clear lens was held in place by two Philips head screws, and half of one stayed in the housing. 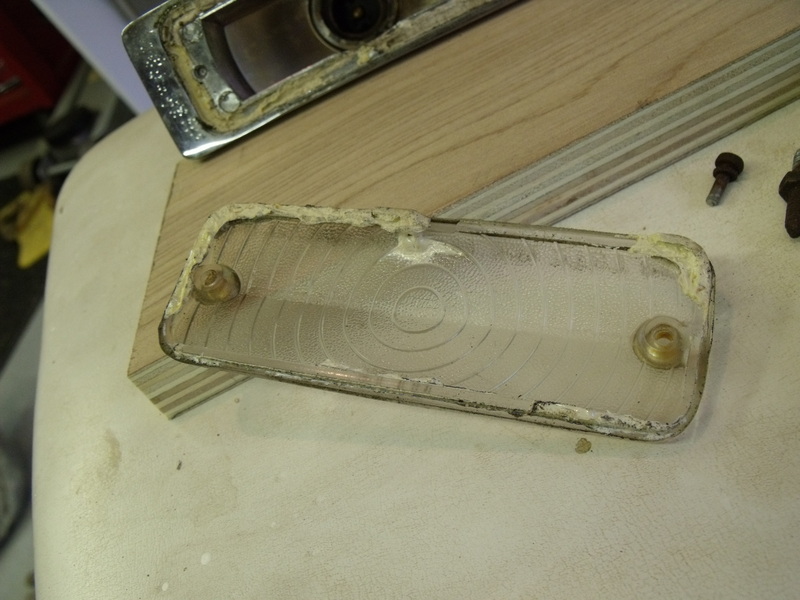 The housing itself used two studs with nuts, and one stud broke in half. Unlike the recessed screw for the lens, the broken stud projected far enough above the housing that a pair of locking pliers got it out the rest of the way. Closeup of housing. Note broken screw on left, and hardened white gasket. The gasket beneath the lens had been some kind of rubber that had turned to stone. It’s likely that it had never been disturbed until now. 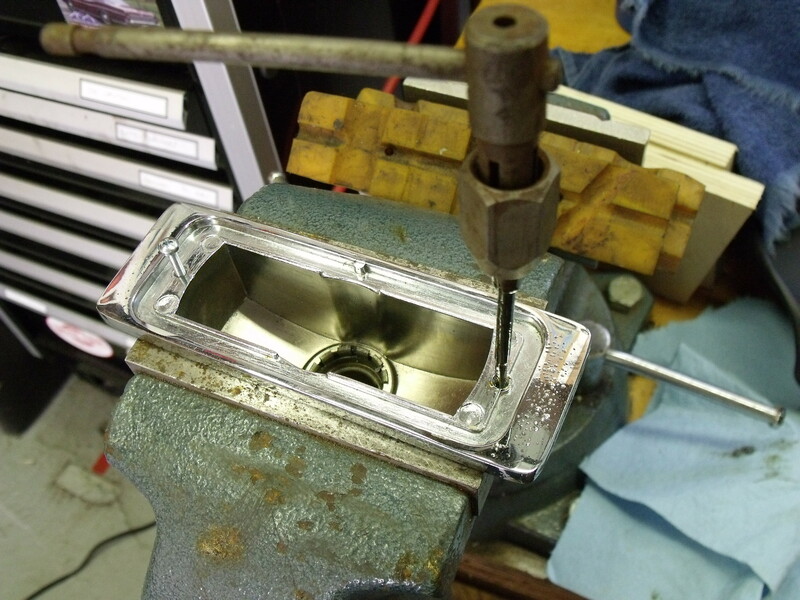 The chrome housing was somewhat pitted, and looked like it would respond to some metal polishing. 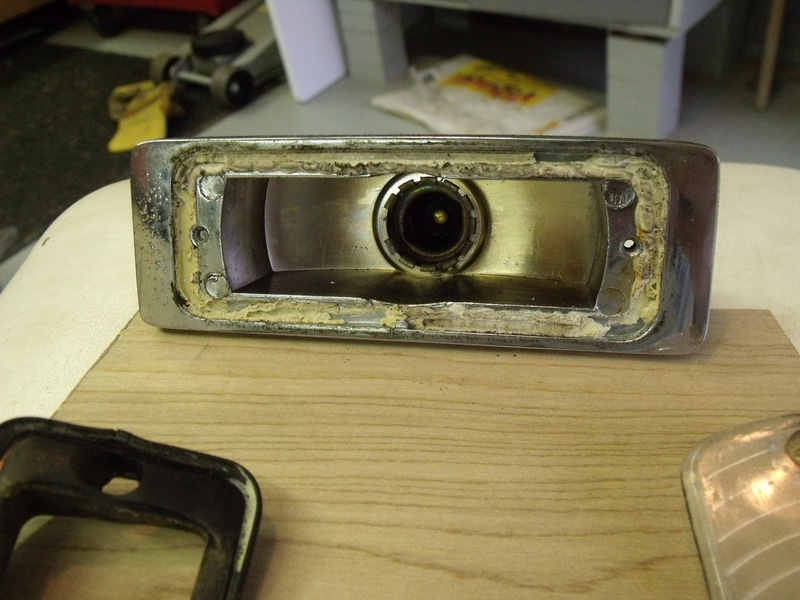 The rubber bezel, mounted between the housing and the painted rear valence, would be treated to a trick I successfully deployed during the Isetta restoration: using Meguiar’s #40 Rubber Reconditioner, the bezel would be submerged and soaked for several days, hopefully returning some of the rubber’s pliancy. I had my doubts about salvaging the lens; the old gasket was that hard. While that sat in its bath, I tackled the removal of the old gasket. This was more of a fight than I anticipated. Not wanting to damage either the housing or the lens, I started with a plastic scraper, but made little progress. Next, I tried various solvents, attempting to soften the material. WD-40 had a minor effect on it, so I kept at it with that, fearful that anything stronger would also harm the lens. The most effective removal tool turned out to be a single-edge razor blade, but this took time. Eventually, both surfaces were rid of the hardened white material. Instead of purchasing a replacement gasket, I fashioned one from sheet cork which I keep just for such purposes. I tacked it in place using non-hardening gasket glue. Three days in the conditioning bath brought the rubber bezel mostly back to its former glory. 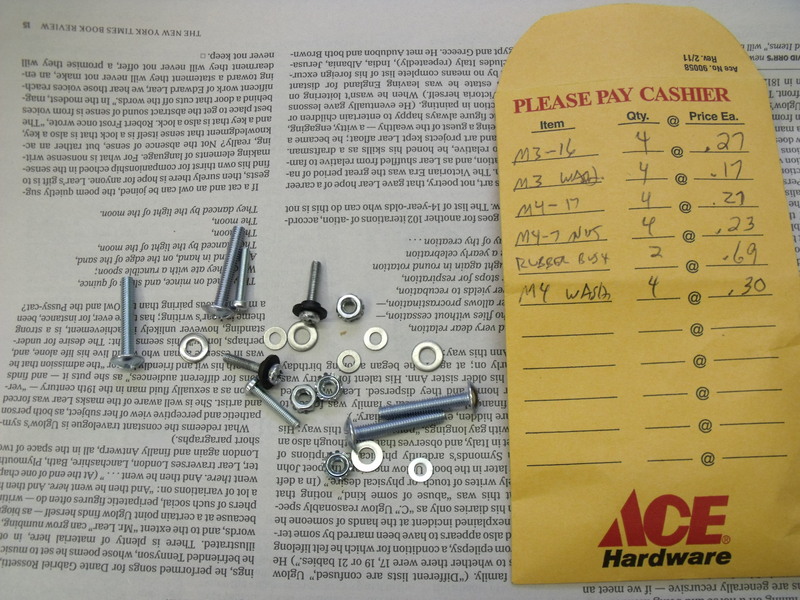 My best shot at finding the metric hardware I needed was the local ACE Hardware store, Post Hardware on Route 22 in Somerville NJ. They had the correct screws for the lens, but not the studs. So instead, I bought bolts with the right thread pitch, and hacksawed off the bolt heads. Viola! Metric studs. The broken screw was drilled out, and retapped with my metric tap and die kit. The studs were installed with a dollop of thread-locking compound. The old incandescent bulb was replaced with an LED bulb from CARiD.com. 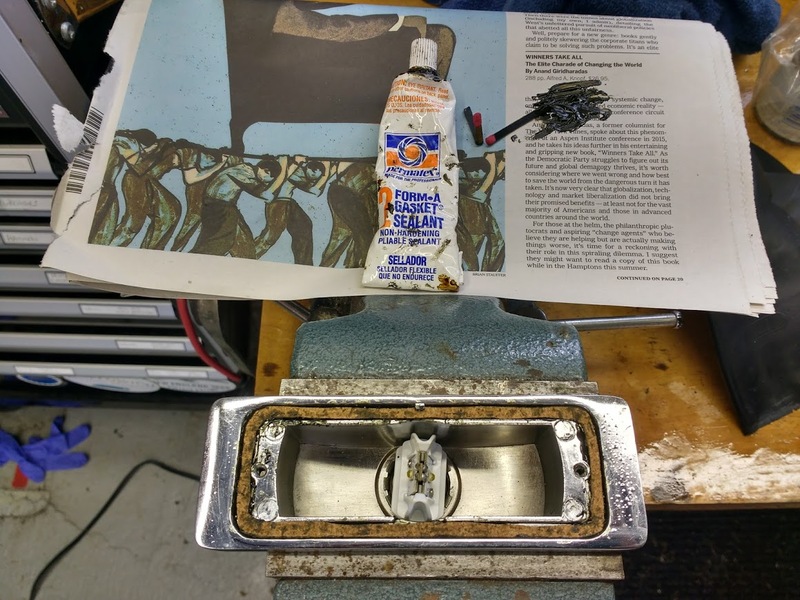 As the repair books state: “reassembly is the reverse of disassembly”. As you can see, the back-up lamp burns brightly. There’s just one more thing to report, but before I do, I must ask you to think like an Italian. You see, when I first tested the refurbished assembly, it still didn’t work. And that’s when I remembered: in 1967, as far as the Italians were concerned, a driver didn’t need the back-up light to illuminate every time you put the car in reverse! After all, it would provide little or no help in daylight. But if the headlamps are on, indicating it’s dark out, THEN a reverse lamp would prove helpful. So the back-up light is wired to come on only when the light switch is on. I’ll be taking a night cruise just to confirm how well I can see behind me…. Nice! It’s the little things that matter. I applaud your painstaking patience in restoring this little piece of originality. Just as impressive is your ability to “think like an Italian” and intuit the solution, apparently without referring to a wiring diagram. Hi Bob, thanks for the comments. Yes, I have the stick-to-it genes to keep at something like this until it’s done. There is a nice sense of satisfaction about completing it. 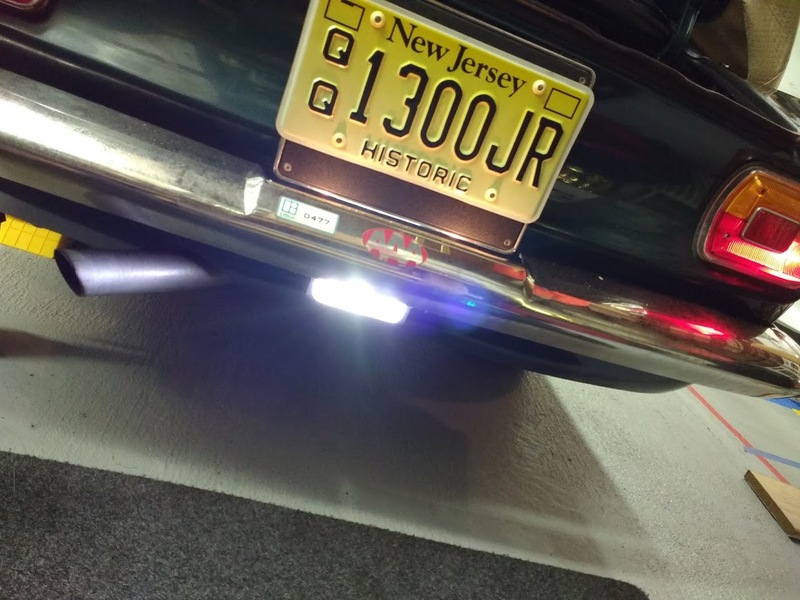 And I must confess, the underhood light works the same way, that is, only with the headlights on, which gave me the idea to check the reverse lamp the same way! !